Volcanoes display the awesome power of Nature like few other events. Earlier this year, ash from an Icelandic volcano disrupted air travel throughout much of northern Europe. Yet this recent eruption pales next to the fury of Jupiter's moon Io, the most volcanic body in our solar system. Now that astronomers are finding rocky worlds orbiting distant stars, they're asking the next logical questions: Do any of those worlds have volcanoes? And if so, could we detect them? Work by theorists at the Harvard-Smithsonian Center for Astrophysics suggests that the answer to the latter is a qualified "Yes." "You would need something truly earthshaking, an eruption that dumped a lot of gases into the atmosphere," said Smithsonian astronomer Lisa Kaltenegger. "Using the James Webb Space Telescope, we could spot an eruption 10 to 100 times the size of Pinatubo for the closest stars," she added. Astronomers are decades away from being able to image the surface of an alien world, or exoplanet. 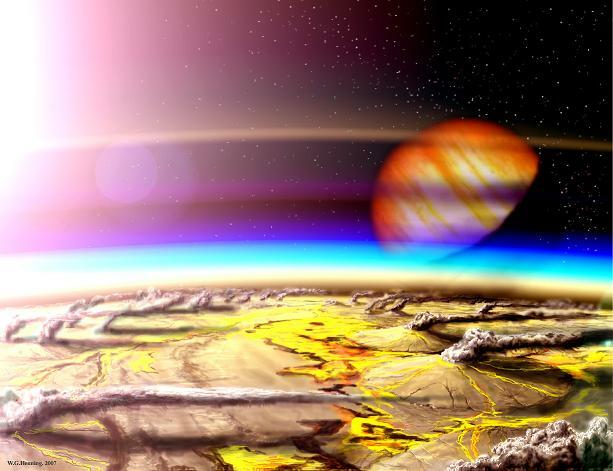 However, in a few cases they have been able to detect exoplanet atmospheres for gas giants known as "hot Jupiters." An eruption sends out fumes and various gases, so volcanic activity on a rocky exoplanet might leave a telltale atmospheric signature. To examine which volcanic gases might be detectable, Kaltenegger and her Harvard colleagues, Wade Henning and Dimitar Sasselov, developed a model for eruptions on an Earth-like exoplanet based on the present-day Earth. They found that sulfur dioxide from a very large, explosive eruption is potentially measurable because a lot is produced and it is slow to wash out of the air. "Our first sniffs of volcanoes from an alien Earth might be pretty rank!" Kaltenegger said. "Seeing a volcanic eruption on an exoplanet will show us similarities or differences among rocky worlds." The 1991 eruption of Mount Pinatubo in the Philippines spewed about 17 million tons of sulfur dioxide into the stratosphere - a layer of air 6 to 30 miles above Earth's surface. The largest volcanic eruption in recorded history, the 1815 Tambora event, was about 10 times more powerful. Such gigantic eruptions are infrequent, so astronomers would have to monitor many Earth-sized planets for years to catch one in the act. However, if alien worlds are more volcanically active than Earth, success might be more likely. "A Tambora-sized eruption doesn't happen often here, but could be more common on a younger planet, or a strongly tidally active planet - analogous to Io," said Henning. "Once you detected one eruption, you could keep watch for further ones, to learn if frequent eruptions are common on other planets." 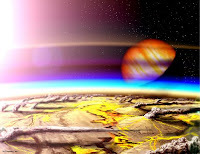 To look for volcanic sulfur dioxide, astronomers would rely on a technique known as the secondary eclipse, which requires the exoplanet to cross behind its star as seen from Earth. By collecting light from the star and planet, then subtracting the light from the star (while the planet is hidden), astronomers are left with the signal from the planet alone. They can search that signal for signs of particular chemical molecules. Due to its proximity, a hypothetical Earth or super-Earth orbiting Alpha Centauri would offer a best-case scenario for a sun-like star. A super-Earth orbiting a smaller host star close to our own Sun would show the biggest signal. But any Earth-like planet less than 30 light-years away could show faint signs of volcanism when studied with the James Webb Space Telescope.